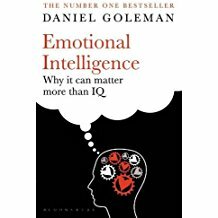 Book Review by Garry Smith – Emotional Intelligence; Why It Can Matter More Than IQ by Daniel Goleman. I finally got around to finishing this book; it has been on my bookshelf for years, unread and therefore unloved. Not any more, I really enjoyed reading this and it is on my highly recommended list. Goleman draws on a vast amount of research to put together a thorough explanation of how we function, or not, using our emotions. He explains some very complex processes using excellent analogies, yes it is now dated as it was first published in 1996 but having just watched an intriguing documentary on psychopathy, everything in that programme was covered by Goleman 20+ years earlier. He explains how genetic predispositions can then be shaped by environmental factors and how we experience socialisation to shape who we become and how we interact with others. I suppose the scary bit is when you sometimes realise you are reading about yourself but it really does help you to understand why some people are as they are, including those you love. I have to say I am now hooked on learning more and more about how the brain works, its architecture and function, the chemicals it produces and what they do. I have already started to use snippets from the book in my teaching self defence, I keep it simple as students do not need the detail, just the headlines, and it is an instructor’s duty though to immerse themselves in the detail so that they can fully understand their subject. I firmly believe that striving to gain as much useful information, not just cramming it for cramming sake, is for myself an intellectual necessity, it is a hunger I have to feed. I suppose I was already a believer in emotional intelligence, I long ago realised the problems with measuring intelligence with IQ tests, I guess that is why it lay on my overcrowded bookshelf for so long. Do I regret not reading it earlier, yes and no, everything has its time and I think I am still learning and will never stop, I try to be the best person I can be, I sometimes fail and now I have a better understanding of why, maybe I can fail less in future.